Your website mentions this broadcast, stating that you wish you had a tape of it. I know of no recording in existence, but I heard the live broadcast in 1958 (I was 15) and remember a lot of it. 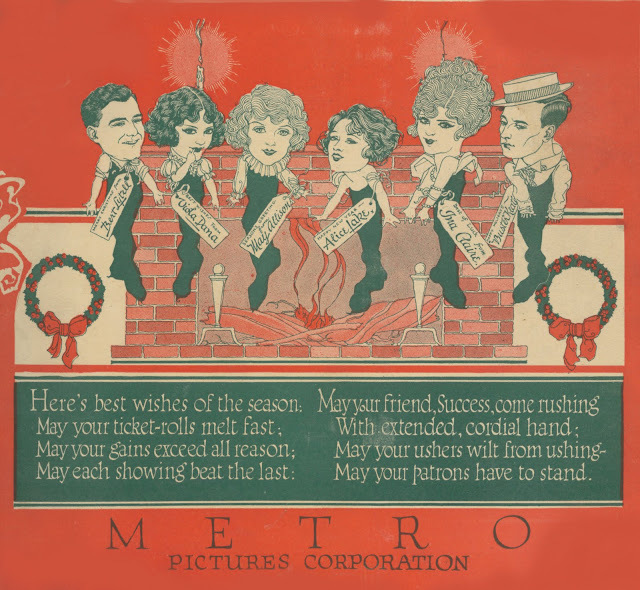 For one thing, Nebel actually broadcast from the premiere, bringing some his "regulars" along, and you could hear the entire movie as it played to the opening night audience. An amazing broadcast. The broadcast was, to my knowledge, the first and only time a complete movie was ever broadcast live on radio. 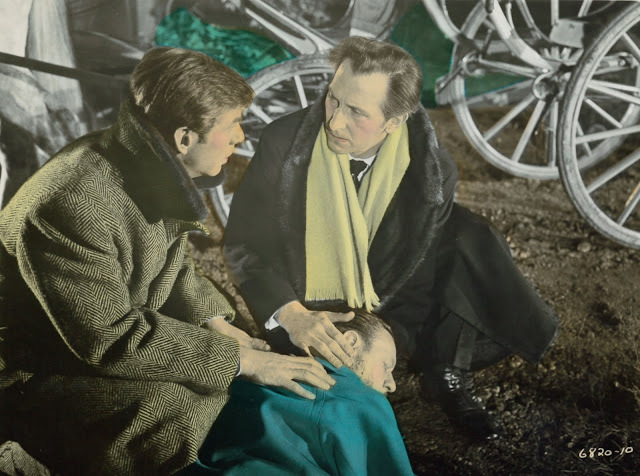 Nebel took some of his regular guests with him to the theater and they helped describe, by whispering into the microphone, the action taking place between the moments of dialogue. The effect was that the broadcasters were right in the audience, but they may have had a box seat or something. You could hear the shocked reaction of the entire audience when stakes were driven into the hearts of the various "undead" characters. By prearrangement with the producers of the film, the broadcasters were silent during the last five minutes, so that radio audiences couldn't figure out the ending. That tactic pissed off some listeners, including me, because we weren't warned in advance that Nebel and his people would conceal the ending from us after we had listened for 80 minutes. You could still hear what was going on onscreen during those final five minutes, but it was all bombastic music, heavy breathing, smashing, etc. Frustrating but tantalizing! After the film, Nebel and his colleagues interviewed several people in the audience. Their reactions to the film were uniformly positive. 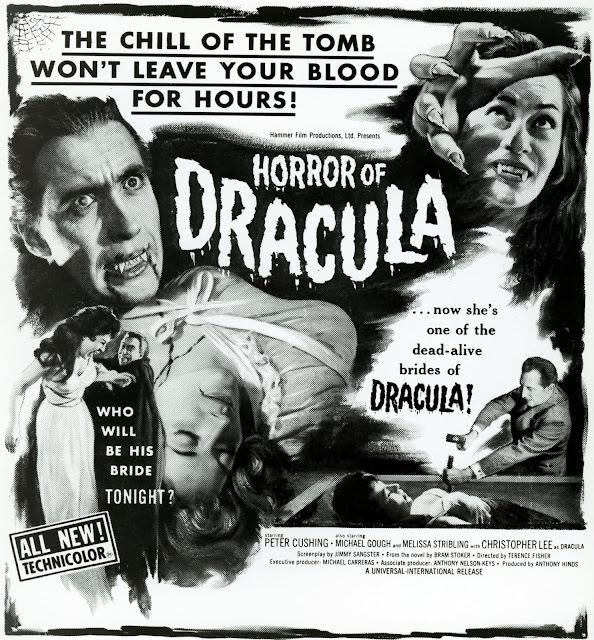 One of the people interviewed was famed columnist Sheila Graham who talked about attributes of the film that were unique at the time, (but that would reshape every horror film made thereafter). 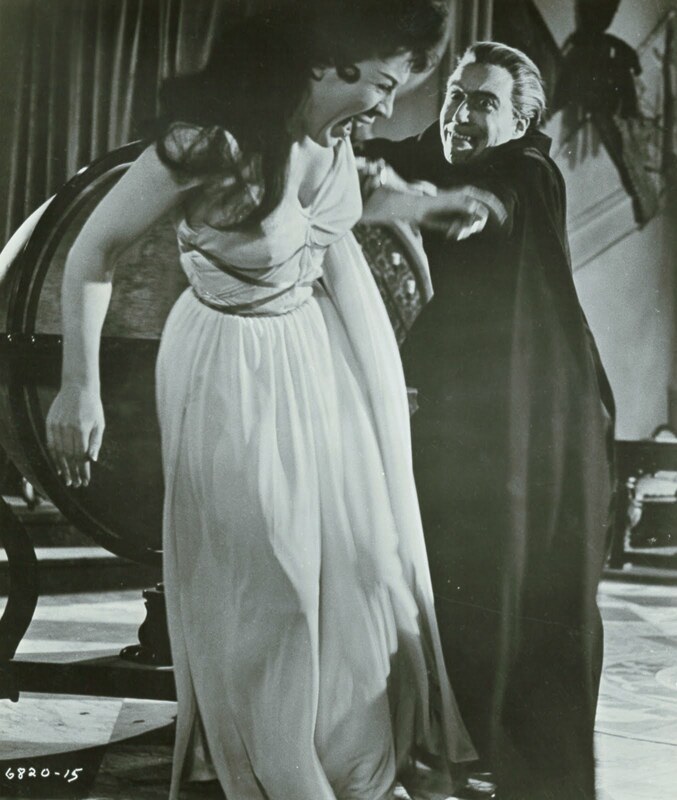 Among other things, she pointed out that the film was sensual as well as gory and that Dracula was a "very handsome man." Another member of the audience was a high school English teacher who said that, if the movie hadn't been so terrifying, she would have loved to bring her students to a showing, because the actors spoke their lines with "perfect diction." She described the effect as "almost Shakespearean." Unfortunately, I don't clearly remember the interview with Peter Cushing afterwards. I do remember something about a tall man standing off to one side in the shadows of the theater startling the departing theatergoers who noticed him lurking there. I believe that man was Christopher Lee, but I wouldn't swear to it. After all, it's been 54 years or so. After all that time, however, Sir Christopher is still lurking in the shadows-- thrilling us. More Horror Of Dracula at Greenbriar Archives: Part One, Two, and Three, plus The Diary Of Jonathon Harker. How much influence was Buster Keaton's physical prowess on high-spirited 20's youth? I'm sure many a boy broke limbs mimicking Doug Fairbanks. How could you not, at adolescent age, try DF leaps for size? Buster had to have bred daredevil attempts among his following as well. I say that with certainty of having twice tried to be Buster. First occasion was High School junior year. We were staging Anton Chekov's The Brute (aka The Bear and The Boor) for an entire student body. I was to play Luka, "the aging footman." Senior (and gridiron ace) Nick Bumgarner essayed the title role, and one scene called for him to shove Luka aside when the latter steps between "Grigory Smirnov" and our lead lady. I wanted to startle the audience with a full-on tumble over chairs positioned for Luka to crash into. Rehearsals pulled the big punch, but I told Nick to really give it to me on performance day. No problem, I said to his protestation that my neck might get broken, for after all, hadn't Buster Keaton accomplished such things routinely? Nick indeed threw me like a fifty-yard pigskin to a crowd's stunned reaction, chairs flying which-way as I slid nearly off stage front. What looked to be a serious injury stopped the show, divine intervention having spared my life and limb(s), but I showed them what thrill comedy was about! Again I'd try the following year. We did a Super 8 silent movie for Dramatics class. 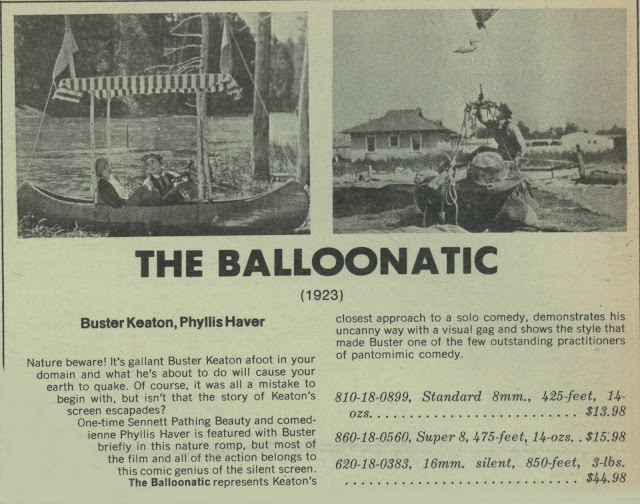 Mine was the Keaton part, gags borrowed from Blackhawk reels at home. This time I jumped off the top of a school bus as a mob gave chase, unmindful until too late of how high one stands (then plunges) from atop such a vehicle (try it some time ... no, don't try it). Courting on-camera risk was quite a high, fool recklesness lending valued assist. I knew they'd all gasp when our footage came back. Was this what attracted Buster, Harold, and the rest to habitual death-defying? 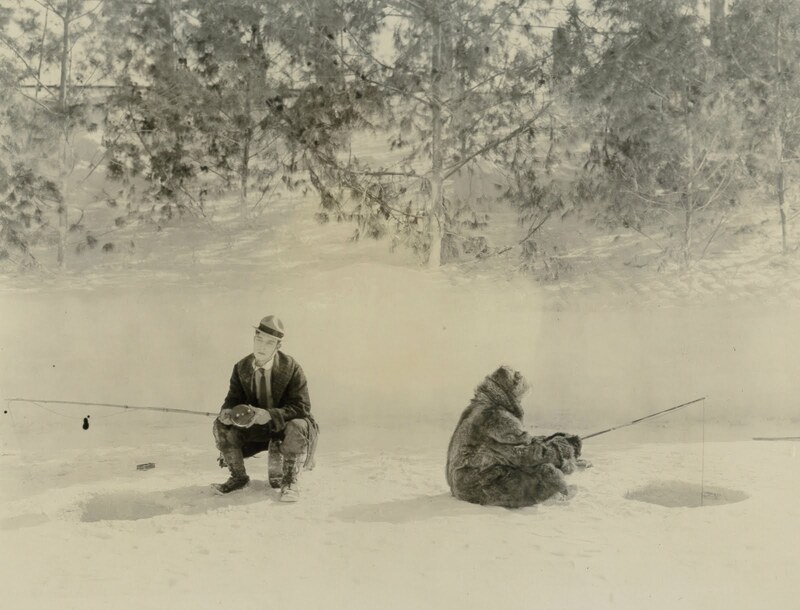 (only unlike me, they knew their business) It's a good thing I grew out of ersatz Buster-ing, though I've got to wonder how many others from the 20's onward looked at his stuff and said I could do that, only to come a cropper upon trying. Are there casualties among would-be Keatons still limping among us? 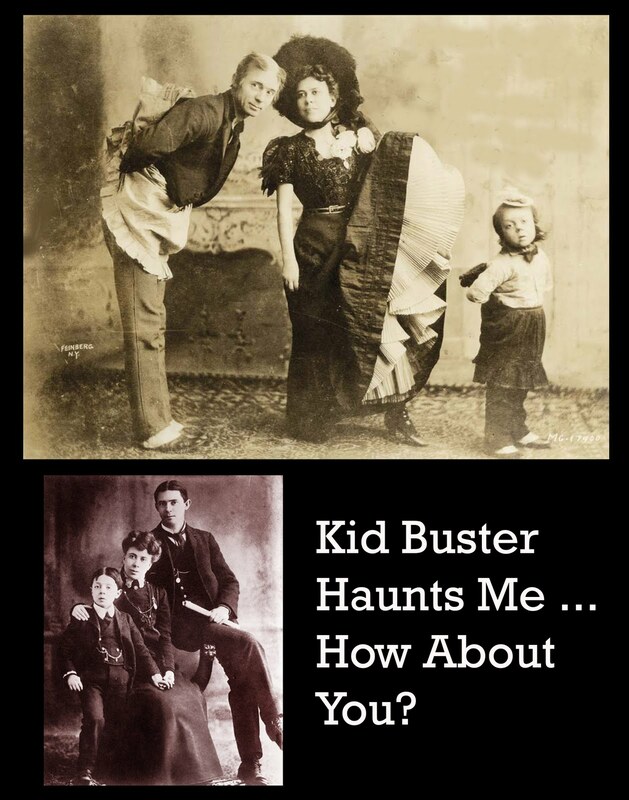 To be Buster, of course, required conditioning oneself from infancy. 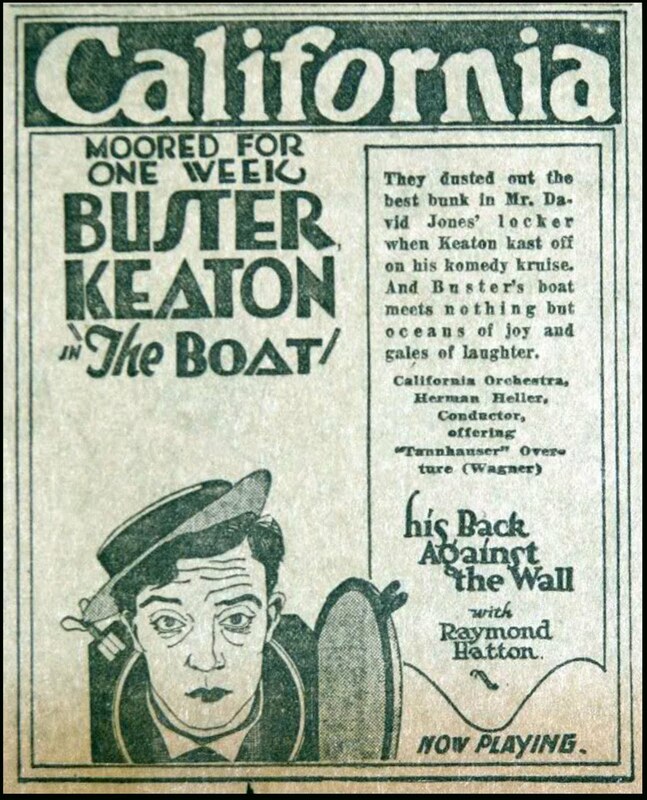 He took falls before he could walk, say books (and Keaton himself, if you buy his account of coming by the "Buster" name). I chill a little at photos of the Three Keatons. He looks like a play-doll that's been dropped (or thrown) enough times to be resigned over bruises to come. Did any of us register as stoic in child portraiture? Buster's was a hard luck life understood and accepted from beginnings, but wait ... didn't vaudeville pay handsome to acts climbing up the bill? Keaton never once claimed victim status for being the human mop he was. We'll never again encounter bark so tough as his. I've pondered alternate reality of Buster missing movies, clinging to the boards until a wearied public saw him out, then retiring to yellowed clippings and a Baby Jane finish. Wasn't that the fate of most ex-vaudevillians? Much of Keaton's greatness lay in high standards he set for himself. The man was secure enough to take his own (extraordinary) level of competence pretty much for granted. Watch The High Sign on Kino's Blu-Ray set and marvel over Buster wanting to shelve it as unworthy to begin his solo series. If this was a dog, give us a kennel-full. Keaton thought The High Sign was too much like recently done comedies with Roscoe Arbuckle. He wanted to deliver better, and would of course, but what a tour-de-force going in! The High Sign has, among pleasures, a remarkable cut-in-half house with Buster up, down ... then down and up, two floors shown full-on, no tricks/edits to betray shortcutting or a comic sans chops to put over acrobatics (minus Buster, you'd need a George Méliès to stage much of The High Sign). 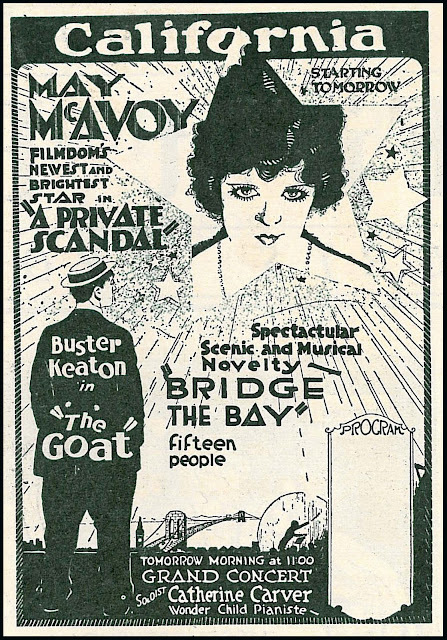 Keaton's long view required situations to play believably though, as he knew careers weren't built performing two-reels of the impossible. They said you could hear Buster's ankle snap during a botched take on The Electric House, which made me appreciate having gone a life (so far) of not witnessing someone's bones break, let alone my own. The sight (and sound) had to be unnerving, though I guess Keaton's crew was used to it. He got hurt a lot and persevered ... what other choice was there? I wonder if Joe Schenck ever tried getting insurance on Buster. Follow-up to the fracture was The Playhouse, a short that managed being even more inventive to cover the fact BK wasn't as much physically engaged. 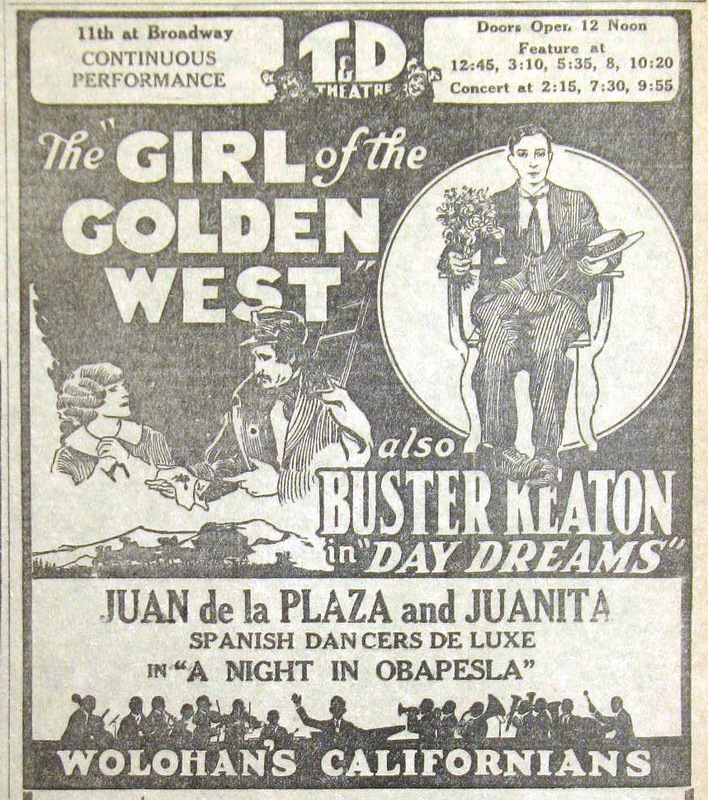 We might thank a busted ankle for his brilliant all-the-cast-is-Keaton dream opening, or the scarily accurate chimpanzee he impersonates a reel later (supernatural Buster again). Did Chaplin build The Gold Rush's chicken act on what he'd seen in The Playhouse? Kino's much upgraded print comes to The Playhouse's rescue. This one looked particularly bad in collecting yore. Previous DVD release Industrial Strength Buster had access to vintage 16mm that was better, and now Blu-Ray ties a ribbon on what I guess is the clearest Playhouse we'll ever see. Upgrades like these, steps up a ladder, can lead to new-found status for a comedy we'd known too long in compromised form. For seeing The Playhouse so buffed and presentable, I can finally place it at or near top echelons of Keaton. If such altered rankings can come of better prints showing up, plus goosed resolution as here, maybe it's time to revisit Best Of Buster lists and revise a few placements. Trades called One Week "The Year's Comedy Sensation," which makes me ask what the previous (and following) year's comedy sensations might have been. What did it take for a single two-reeler, out of hundreds released per annum, to break out of the pack? I do know from theatre ads that Shoulder Arms was considered gold standard for laugh-making, a repute it maintained for over a decade past the teens when first released. Something about One Week clicked, the roaring reception being what Keaton needed to launch his one-man craft. Distributing Metro sold BK like features, and presumably got rentals not far short of what longer forms earned. I can understand reluctance to use him in multi-reelers. 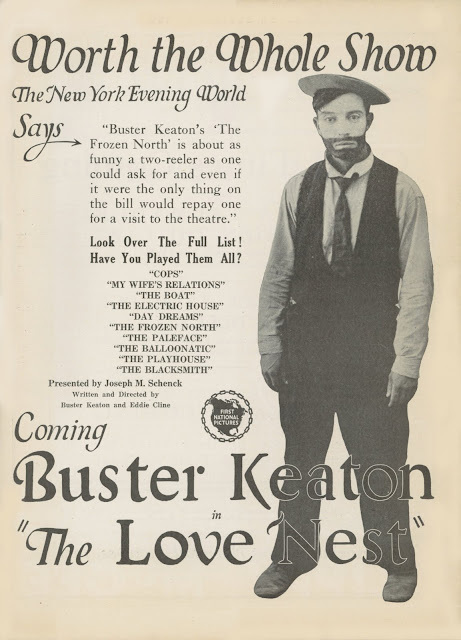 These shorts, and Keaton was prolific getting them out, could prop up a whole season's slate of duds. 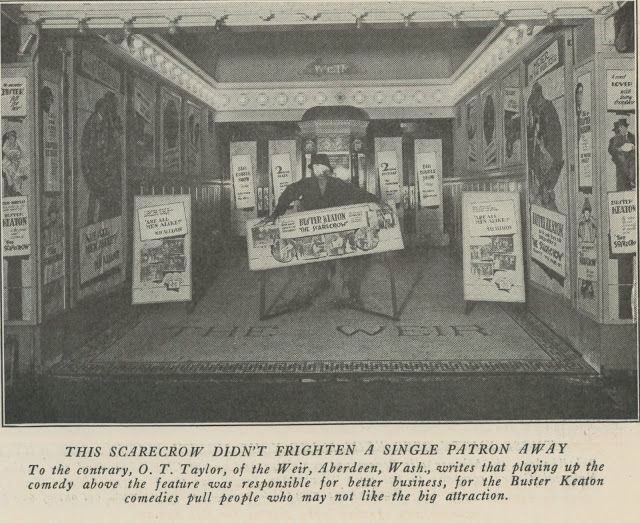 Trade ads here (and certainly the theatre front display for The Scarecrow in Part One) confirm Keaton's two-reelers were tails wagging many a dog for his distributor. I've read that Buster got 25% of profits from his shorts. Did he trust Joe Schenck and Metro as to accounting? I suspect so. Schenck seems to have been like a father, or at the least big brother, to BK, much as Roscoe Arbuckle had been. Keaton trusted his friends, and neither of these appear to have cheated him. Maybe the comedies made such piles of cash for all concerned to swim in gravy. 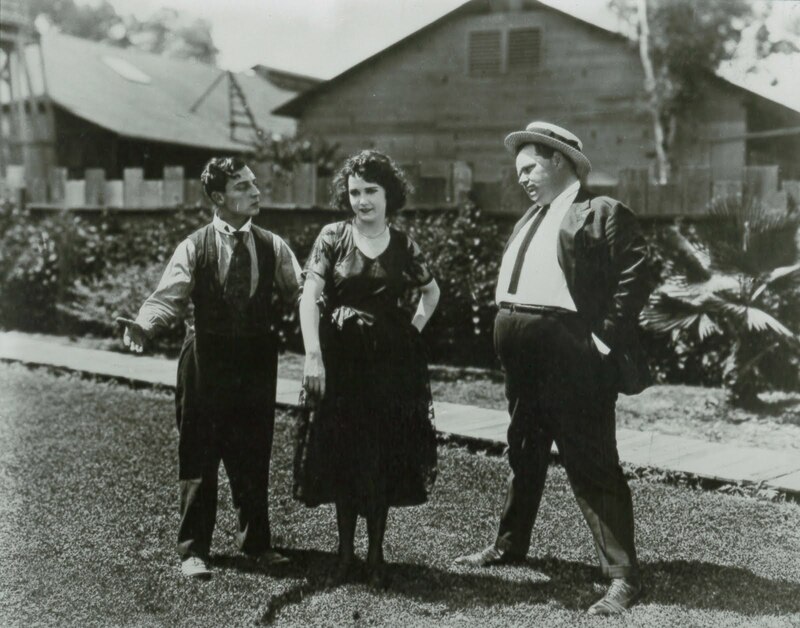 Times were obviously good if Keaton could afford giving Arbuckle a cut after Roscoe was kicked out of movies (was there industry precedent, before or since, for such generosity?). Investing partners in the BK venture included both Schenck brothers, Marcus Loew, banking tyro A.P. Giannini, and Irving Berlin. Talk about heads of the five families! They had "stockholder meetings" over weekends in Atlantic City, bacchanal-ing there I'll leave to speculation (bet Fatty's Frisco frolic was a pink tea by comparison, though). To answer the key question here --- should you upgrade from earlier Kino DVD releases? Big yes, emphatic yes. I compared most of the Blu-Ray with old versions. No contest ... they're like different shows altogether ... darkness into light. The only way we'll improve on these is if someone comes across better pre-print on Hard Luck, Convict 13, the missing parts of Day Dreams ... whatever remains on the Keaton wish list. I'd almost expect that to happen at current rate of thought-lost stuff turning up. 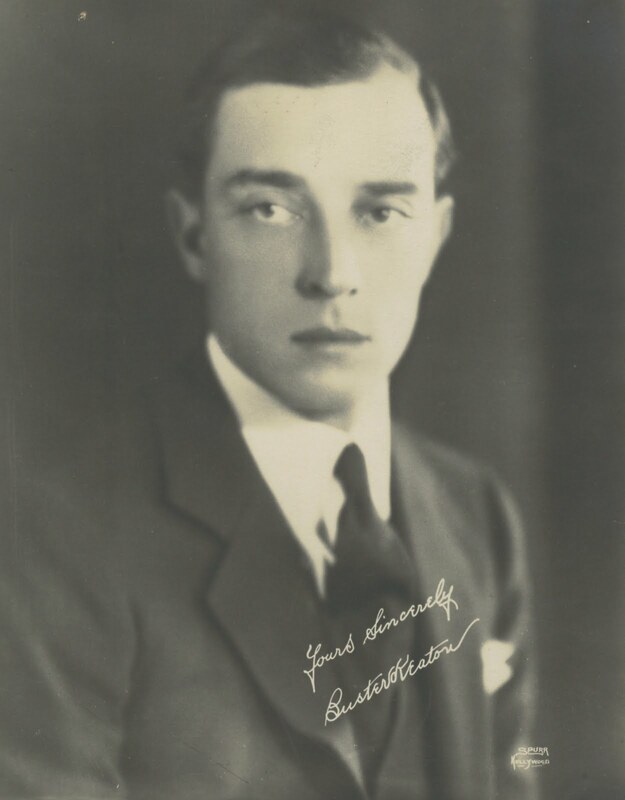 More Buster Keaton at Greenbriar Archives: Keaton Misses Grand Hotel, Le Roi des Champs-Elysees, The General, Best Keaton Book I've Read, They Dood It Twice (Spite Marriage), The Night It Came Together (Sherlock Jr.), and Keaton Columbia Comedies. Kino's just rewrote the book on Buster Keaton's early solo career by releasing all his silent starring shorts on Blu-Ray, a real game changer for folks who've sat years squinting at crummy prints of nineteen gathered here for a first time. There'll be reevaluation afoot now that we can see them through something other than stained glass. Not all play pristine. Elements of several would be rugged to point of disposal but for necessity of including all nineteen (and isn't it lucky that none are missing). Collectors submitted too long before hobbled representation of these, so Blu-Ray availability comes much as Lazarus rising from a grave. 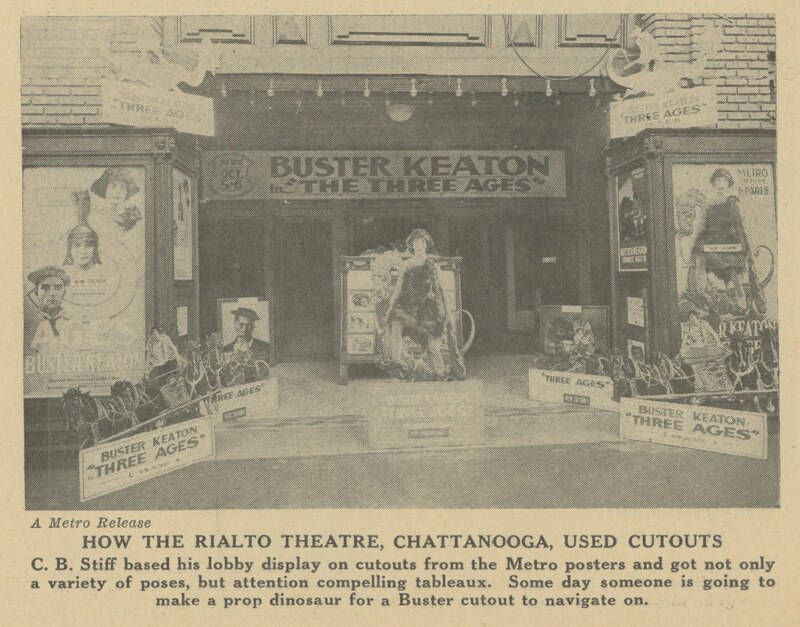 Bits, pieces, and whole subjects gradually surfaced over years since Blackhawk Films and others offered handfuls and no more, making it now possible to close examine Keaton's two-reel bag. I've treated the set as delicacies over several past weeks, not wanting to burn through it too quick and blunt pleasure of seeing all so lovingly rendered. Why rush after forty years waiting? 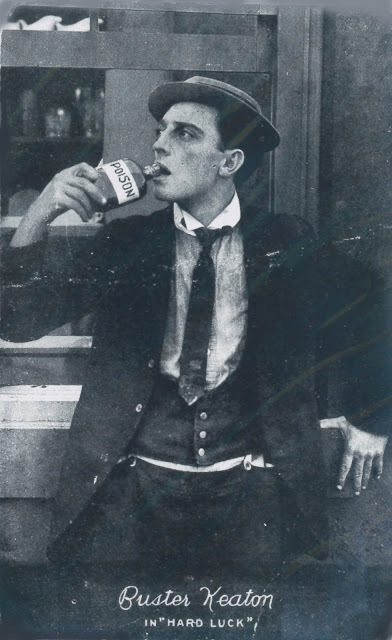 One way Charlie Chaplin had it all over Buster Keaton was superiority of prints. The fact CC owned his negatives made it possible to preserve and present films throughout his lifetime and on his terms. Keaton's legacy had to make ways as best it could despite ownership of comedies residing with others or languishing in the public domain. Preservation efforts did not even begin until it was almost too late. Not a few titles were in deplorable shape. Chaplin, on the other hand, tendered sparkling quality to confirm he was top man on comedy's ladder. For this, if nothing else, the contest was never an even one. 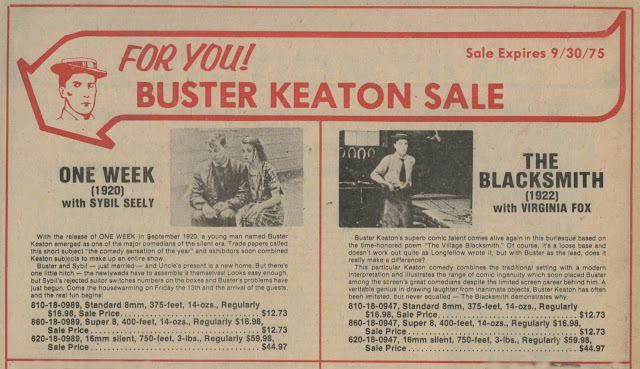 How could Keaton's compromised inventory win over audiences (if not a critical community) spoiled by closer-to-original elements a moneyed Chaplin could display? Sobering it is to think of last surviving Keatons dredged out of a storage shed at his former home, twenty-five years after he'd quit the place. I saw footage of that dark recess in a video home tour and marveled over nitrate film surviving there so long. I'd not have entrusted a push mower to such bleak space, but what I haven't seen and would like to is an inventory of titles they took out of there. There was Harold Lloyd too in possession of glowing elements and dollars to showcase them, even if he generally chose not to. From what I've read, Harold's vaults were at times kind of a mess as well. It wouldn't have been fun going into such heat and dark to catalogue this stuff --- especially with commercial prospects doubtful as they were for silent pics. 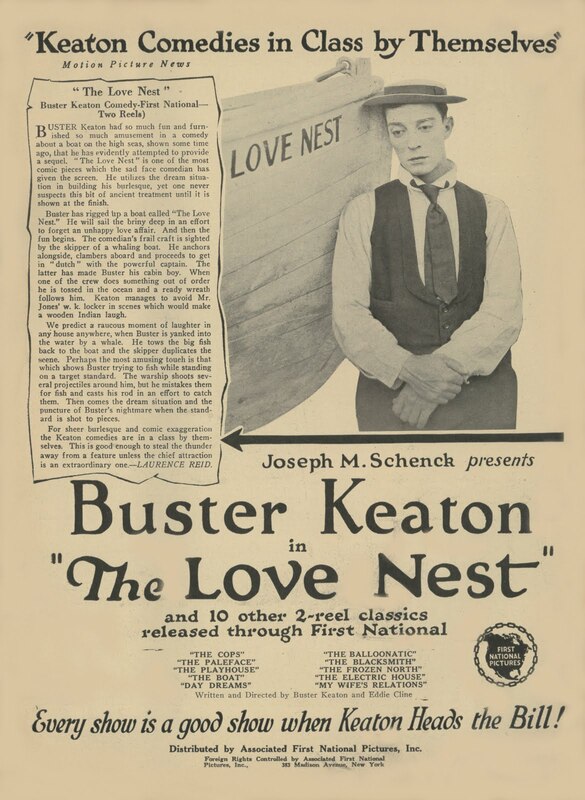 Keaton had a higher hill to climb than Chaplin/Lloyd who at least had oldies in basements or nearby storage, and yet Buster seems to have passed both in posterity's estimation. Kino's Blu-Ray release will renew argument over whose two-reelers were better. 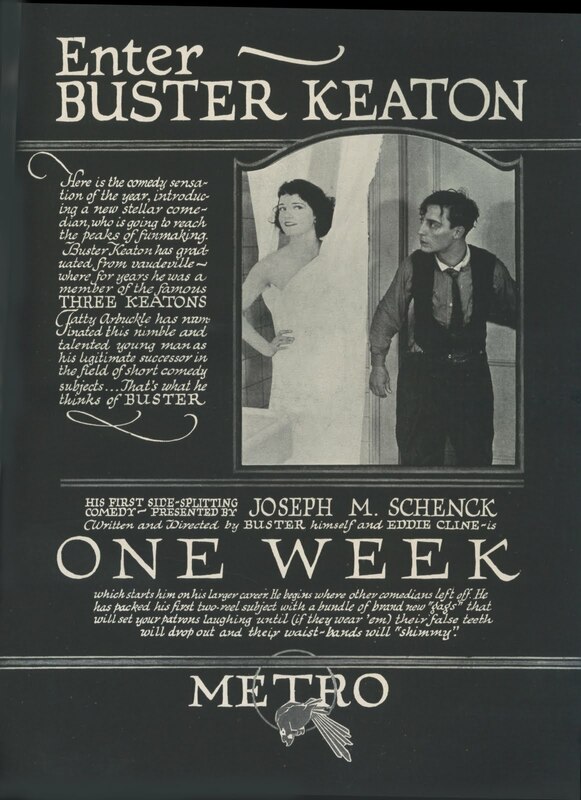 Is it safe saying Buster's equal or surpass all but maybe the Mutual Chaplins? There are numerous Lloyd shorts at least as funny as either Chaplin/Keatons ... might his place first as a group? It's any fan's opinion, of course. Some will tender other comics as having a preferred backlog, Langdon perhaps, even Arbuckle or Lloyd Hamilton. There's been aggressive moves to define The Best in terms beyond the The Big Three. I happily revere them all, and care not to argue for one at the expense of others. It's thrill aplenty to tick off another group of comedies and have all in one place rather than spread among discs as Keatons' previously were. With Laurel and Hardy aimed for can't-come-too-soon October, this promises to be a banner year for closing collector gaps. Some of you will remember. Others might profitably skip my further meandering over lawn mowing and saved allowance for 8mm realization of two-reel dreams, the term itself a dated one for fact these no longer arrive on reels at all, roundness of discs being sole counterpart to what formats used to be. But wait, even that's changing, for haven't I spotted Sherlock, Jr. and Our Hospitality lately on Netflix HD, along with others streaming in standard-def? 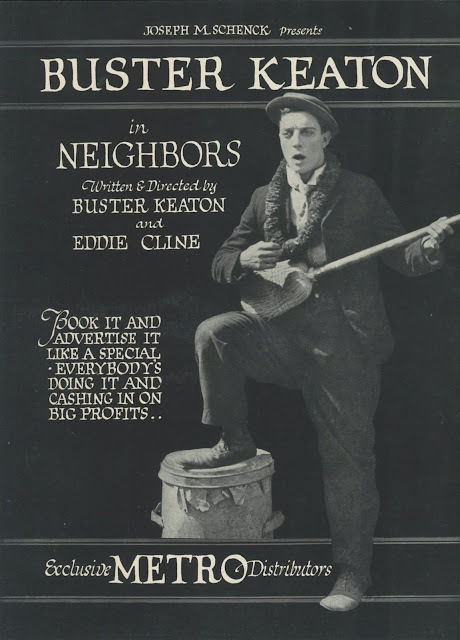 What I recall best of Keaton shorts on film was how muddy most looked. I'd watch The Balloonatic and more or less have to guess what was going on. We needed young eyes to make allowance for ink blots that passed for Buster and pursuing Cops, a subject for which I mailed ten one-by-one-got dollars to Griggs-Moviedrome in waning winter of 1970, counting myself among an elite for two silent reels roadshown exclusive in my boy-room Bijou (dubbed the Parkland for imaginary ads I'd draw). It's all the more a marvel then to step back and regard how much better Keaton and other silent subjects look the further out we are from when they were made (shouldn't it be the other way around?). Remarkable too is stuff thought lost continuing to turn up, including elements to upgrade Buster's comedies from what Kino earlier released on DVD. Has the Internet and enhanced communication been key to so much unearthing? 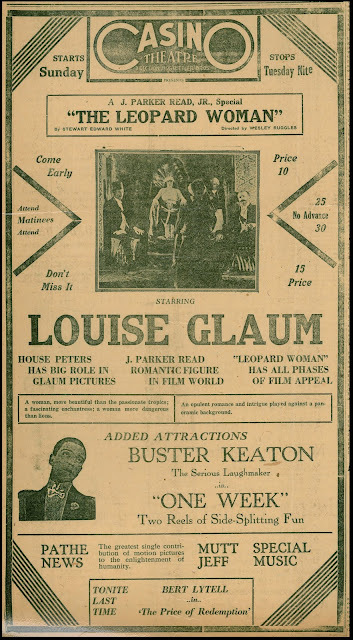 Again, it's new-found clarity that bring third dimensions of Keaton into (razor) focus. I looked at The High Sign and paid more attention to background clam chowder signs (a dime for a dish!) and 20's extra folk than Keaton himself ... most a blur before. Suddenly real-life pulsates around foreground Buster, levels to enrich many a repeat sit. These nineteen shorts are as many time machines ... being funny (when they are) is just gravy. Are laughs still there? 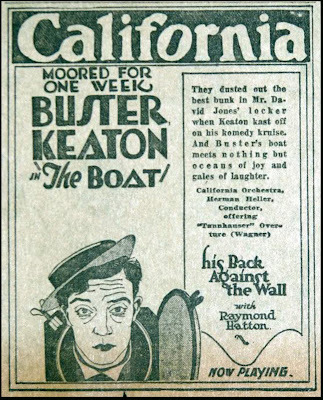 The old Keaton conundrum applies as ever ... he's more breath-stopping than humorous to a not inconsiderable group (BK himself acknowledged the same issue when testing his comedies new). Some will always look on Buster more as magician than clown, or as a stunt performer daily putting life/limb in jeopardy. Moments find me still regarding him as more supernatural than real (as in, did a human being just do that?). Once I casually pointed out He nearly got drowned here during an Our Hospitality run and that cooled friends' response to what was left --- they focused on risk rather than laughing reward. Sometimes (if not always) it really is better to keep your mouth shut when sharing movie passion with others. The Boat is among supernatural Busters. You'll remember it as one (of several) where Keaton engages a prop that could as easily deep-six or crush him. Later it would be bigger boats, then trains, but here for twenty-three minutes was hardship comedy I yearned to get past before Buster (and two little kids) swallowed half an ocean on verge of towing them under. 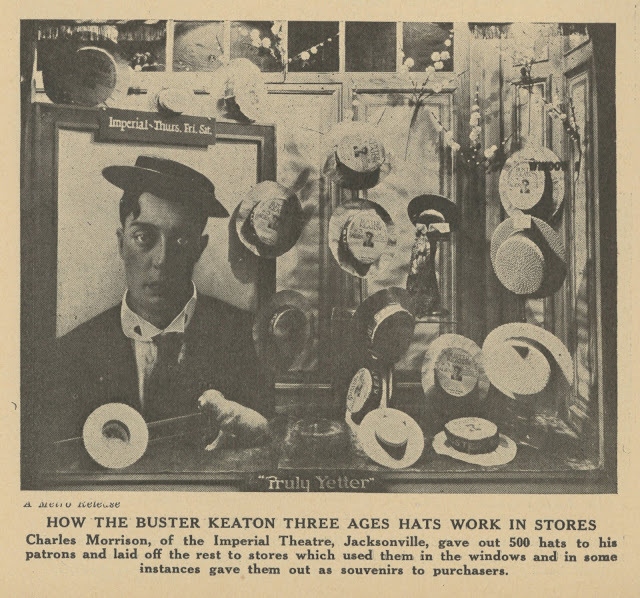 Did Keaton measure comedy's value in terms of calamity he endured? 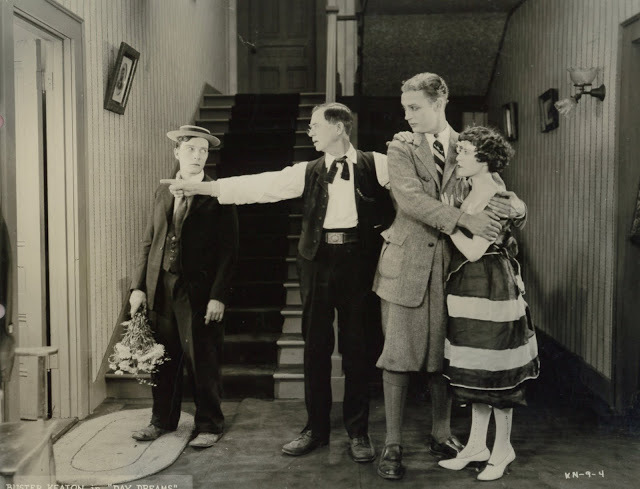 If his was a goal of being the iron man of mirth, surely there was none to compete (Larry Semon took punishment to maybe greater, but less artful, extremes). Here's further query to experts ... Did comics before Buster harness such large and formidable props as he did with The Boat? 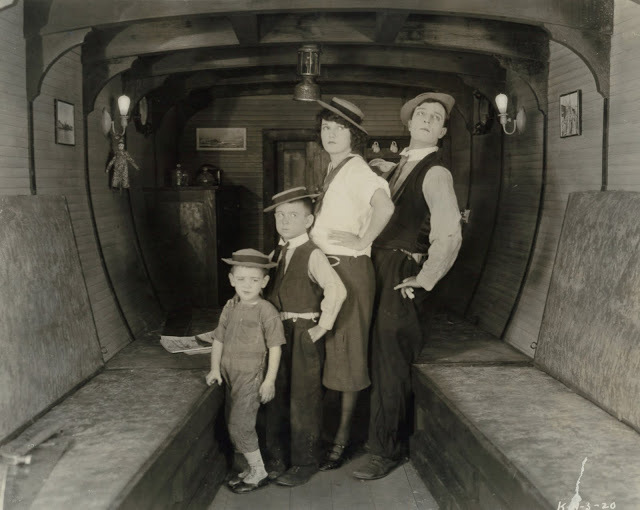 (you could argue that Harold Lloyd used whole buildings for his) Keaton's short, like some of Lloyd's, amounted to comedy meeting physical peril with laughs earned at safety's risk. Did audiences then-respect comics more who were willing, like circus daredevils or stunt flyers, to put lives on the line for customer's entertainment? 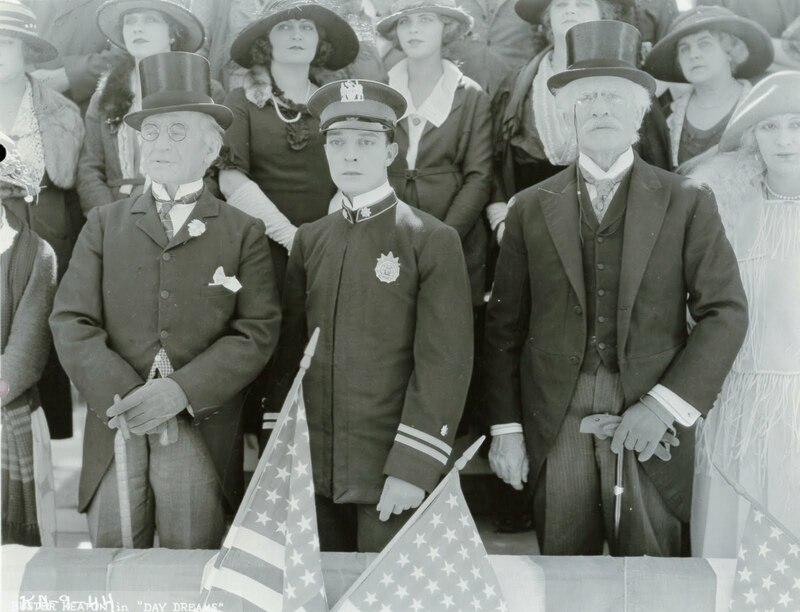 So if Buster Keaton has passed Chaplin and Lloyd, that would, I suppose, make him the most popular and recognized of all performers who appeared in silent films. What long-awaited comeuppance for Talmadge sisters and like-minds who treated BK like pennies waiting on change. Too bad they can't come back just long enough to take receipt of that memo, critics too like ones who left Keaton's features in the shade. 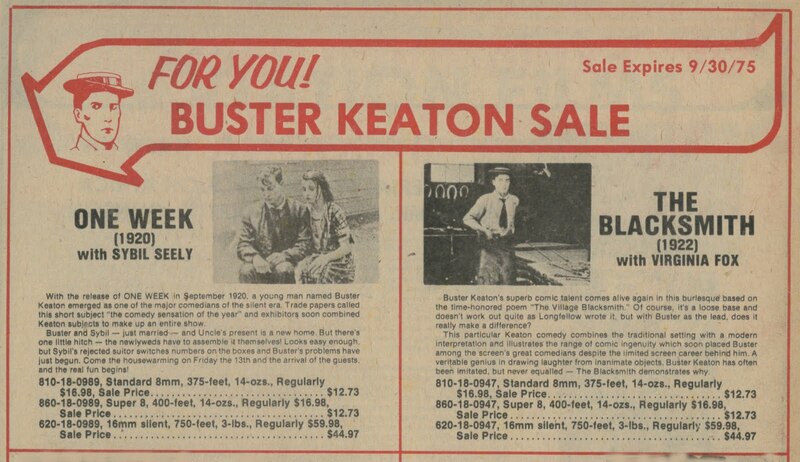 Are Keaton Blu-Rays outselling Chaplin's so-far released Modern Times and The Great Dictator? Snoops like me want to know, for no reason beyond confirming that Buster's once and for all scored the knockout punch to rivals. 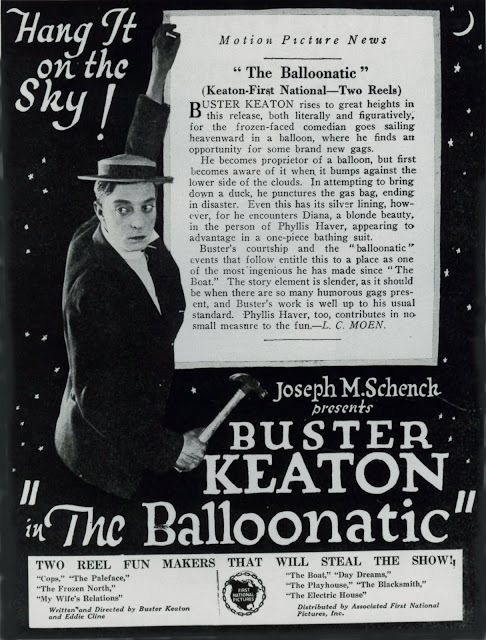 Heck of it is that Keaton was never competitive with others who clowned, so he never referred to them as rivals, which calls to mind an anecdote wherein a Chaplin daughter brought home a date who, in a stunner instance of lapsed tact, told Charlie that Buster Keaton was the better comedian, an assertion from which CC recoiled to a fortnight's despair. 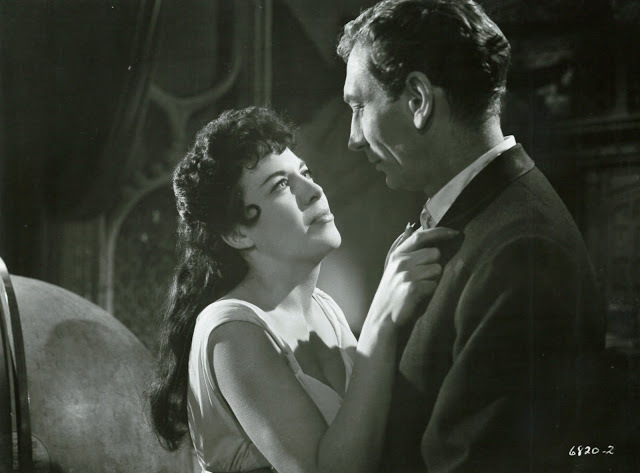 Five Graves To Cairo played TCM last week. It seems incredible that Billy Wilder's second directorial effort is not available on DVD. Five Graves has been overlooked ... dismissed really ... as mere wartime propaganda. Even co-writer Charles Brackett identified it as such in a late 50s interview. Wilder subverts wartime movie convention throughout Five Graves, it being a riff on combat dramatics taken seriously by others (WWII films were closely monitored by the Office Of War Information). He'd not be the first or only director to break rank with conflict protocol. 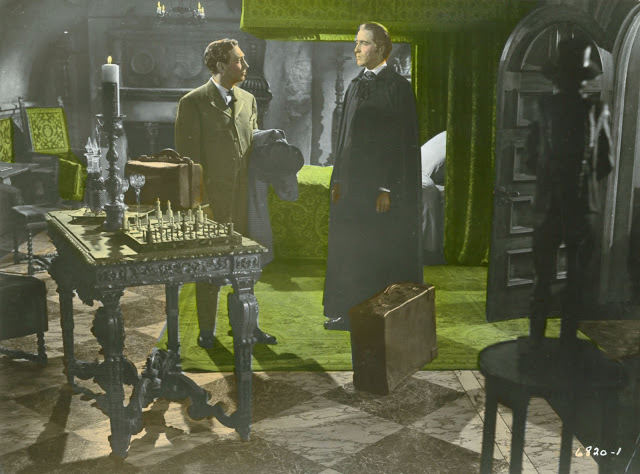 Ernst Lubitsch had made mischief with To Be Or Not To Be, a comedy seasoned with menace that played straight the enemy threat even as it ridiculed same. Being a Lubitsch acolyte, Wilder had to have been inspired and influenced by To Be Or Not To Be, utilizing no small part of its unique approach when writing Five Graves To Cairo. The films have a lot in common, with more wit between them than combined effort of war-themed filmmaking otherwise. Wilder, like Lubitsch, saw humor in the grimmest situations. Five Graves' concept is a fanciful one that could easily have tipped into comedy. Had Wilder done it mere months past declaration of peace, I've no doubt he'd have aimed direct to patron funny bones --- the thing's rib-tickling enough as it stands. What a relief for audiences in 1943 to encounter a war movie so brimming with cheek and the unexpected. Brackett and Wilder wrote (fast) just in front of daily dispatches. News out of the North African campaign anticipated Allied victory, but it could've finished the other way, a contingency that would neatly have scuttled Five Graves To Cairo. 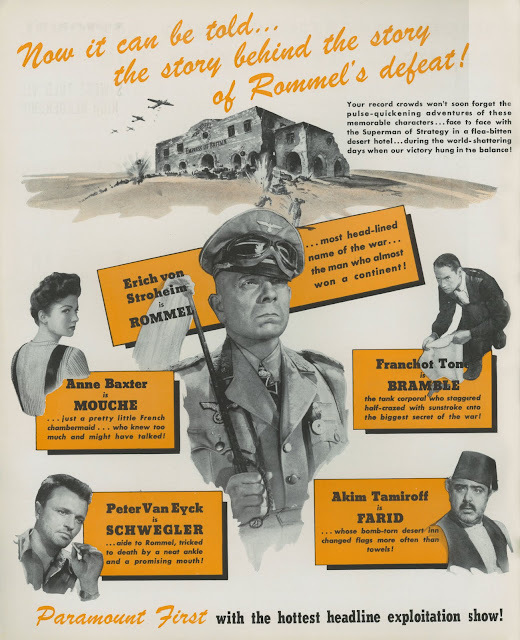 German Gen. Erwin Rommel's defeat propelled completion of B&W's spin on the topic, giving Paramount a release timed perfectly to breaking news. Casting might have gone differently amidst less hurried effort. Cary Grant was initially sought for the male lead. He fortunately turned that down. 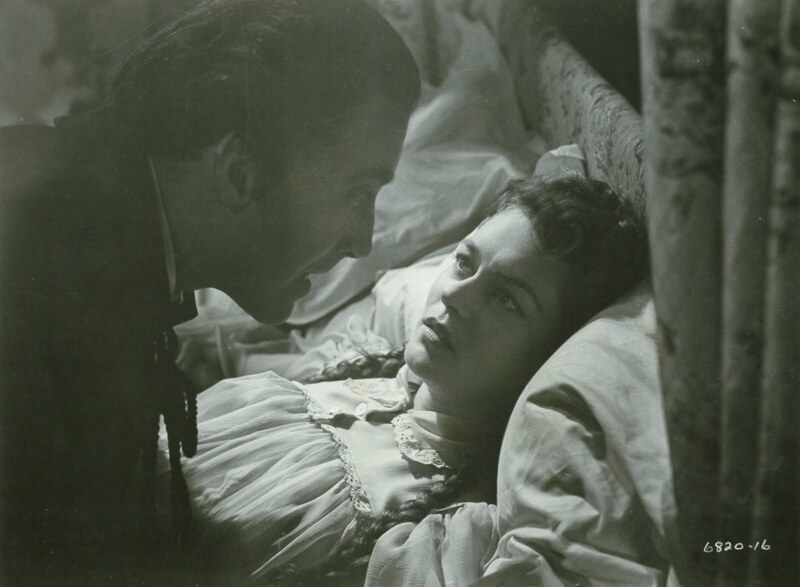 Ingrid Bergman had been set as of November 1942 in the role played eventually by Anne Baxter, the former's participation okayed by David Selznick, who held her contract, but nonstop work on Casablanca and For Whom the Bell Tolls made necessary a rest period. Grant and Bergman would have made of Five Graves a very different show, Grant being at the least on-set fussy/image protective by this time, and sufficiently empowered to have his way vis-à-vis directors who disagreed. Bergman's participation would bring as baggage Selznick's interference, something Wilder could not necessarily have overcome at such an early stage of his directing career. 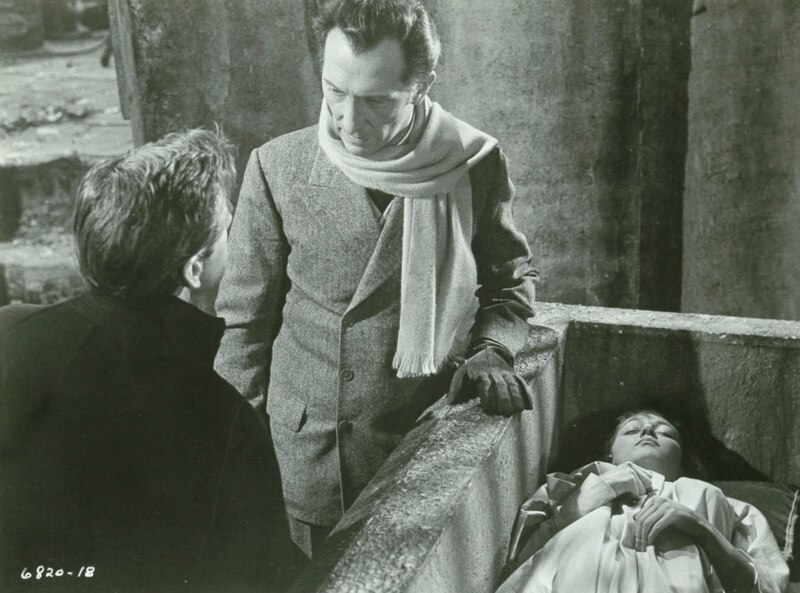 Had these been Bergman and Grant, we might not have so good a picture as Five Graves To Cairo to look at. 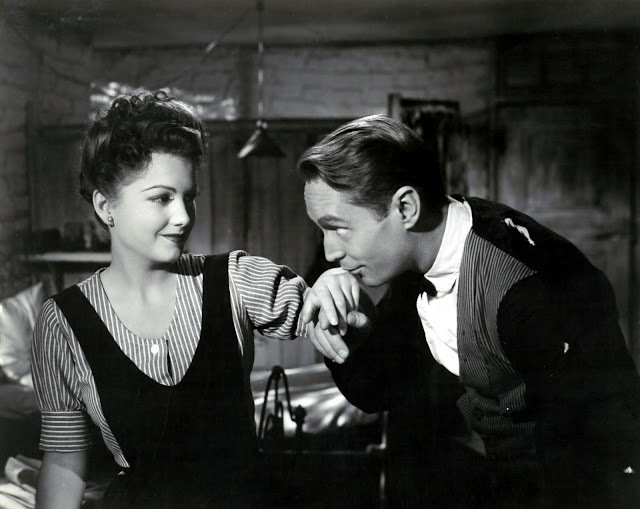 Having Franchot Tone and Anne Baxter as below the title leads enabled Wilder to put more of his own vision across. 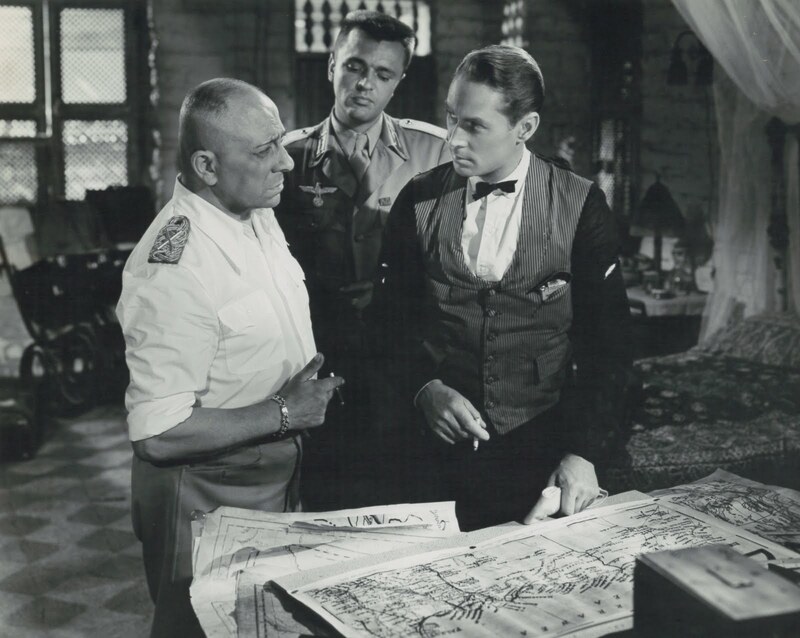 Besides, this director's idea of Five Graves' star was supporting player in name only Erich von Stroheim, tabbed to play real-life arch-nemesis Field Marshal Rommel, focal point and loving object of Wilder's fascination throughout filming. Stroheim arrives a couple of reels in and dominates from there. The camera, as though hypnotized, places him center. Von was something of an idol, if not role model, for his director (Wilder had gotten an autographed EvS photo while still in Germany and kept it throughout his life). Stroheim was indulged as to character embellishment and even dialogue additions to keep Rommel dominant. Bigger names than Tone and Baxter would have sidelined EvS, certainly he'd have ceded, if reluctantly, before Grant and Bergman. As it is, The Man We Loved To Hate rolls over a not-so-imposing cast like Rommel's tanks, Wilder his complicit all the while of doing so. 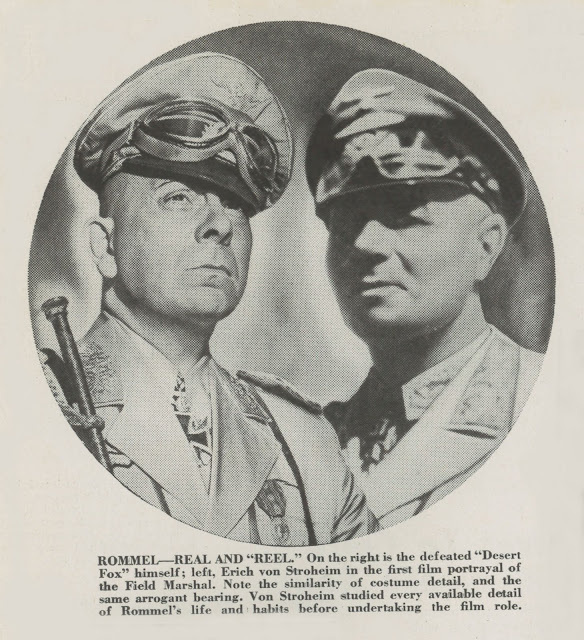 Writers Brackett and Wilder came up with a brilliant back story for Stroheim's Rommel. You'd think it was all true for conviction they brought to such an audacious set-up. Seems Rommel had set conquest plans in motion by entering Egypt years before in the guise of an archaeologist, at which time he and a team of like-minded Germans planted caches of weaponry over hundreds of desert miles in anticipation of a later siege. 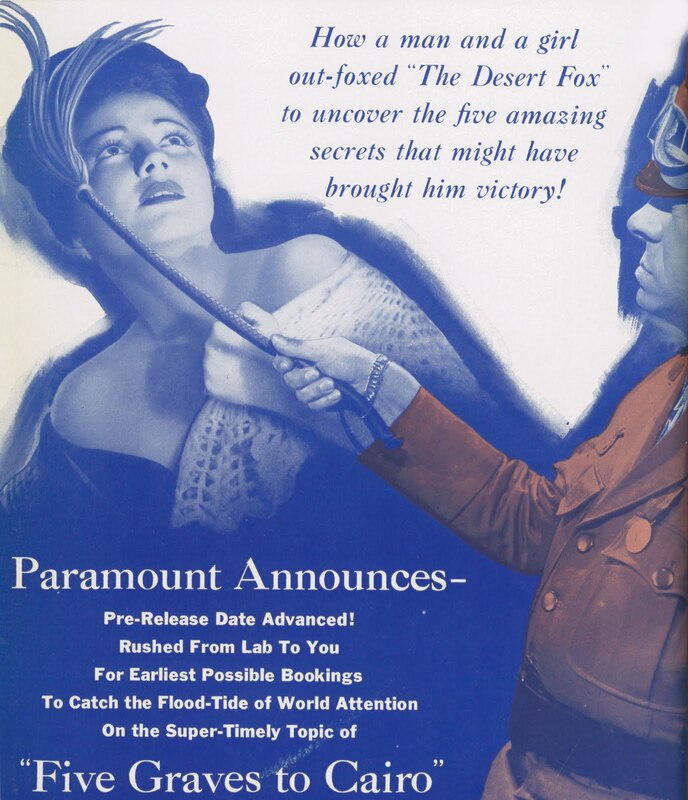 I don't doubt a lot of viewers in 1943 took Brackett and Wilder's imagining for fact. I almost did, or at least wanted to. The real Rommel had been put to rout some months before Five Graves to Cairo opened, his African campaign scuttled by the Allies. Wilder and Stroheim's interpretation of the Desert Fox may not have been accurate, but it was great showmanship, Rommel having assumed a near mythic status among great enemy tacticians of the war. In fact, a still living Rommel was the key to selling Five Graves To Cairo, a genuine star name off front pages as opposed to mere movie actors plying all too familiar trade. Did it matter if Stroheim resembled him? Not much, especially now that Rommel was sidelined and no longer a threat. Besides, how could the real thing be so entertaining as Von? Paramount's topic, being hot as desert sands Wilder photographed, needed to be got out quickly as possible to trade on the public's awareness of recent North Africa victories. 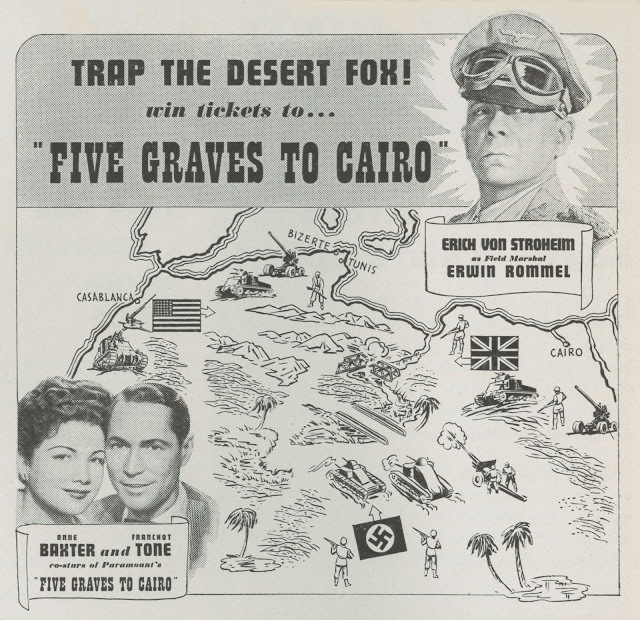 Part of excitement surrounding Five Graves To Cairo was said rush into theatres. This one was handled more like a newsreel than a feature, timeliness of the subject making urgent its earliest possible availability. General release had been set for July 1943, however, Paramount sales staff jumped the gun, in Variety's words, by going for May pre-release dates in New York and other Eastern/Southern areas. 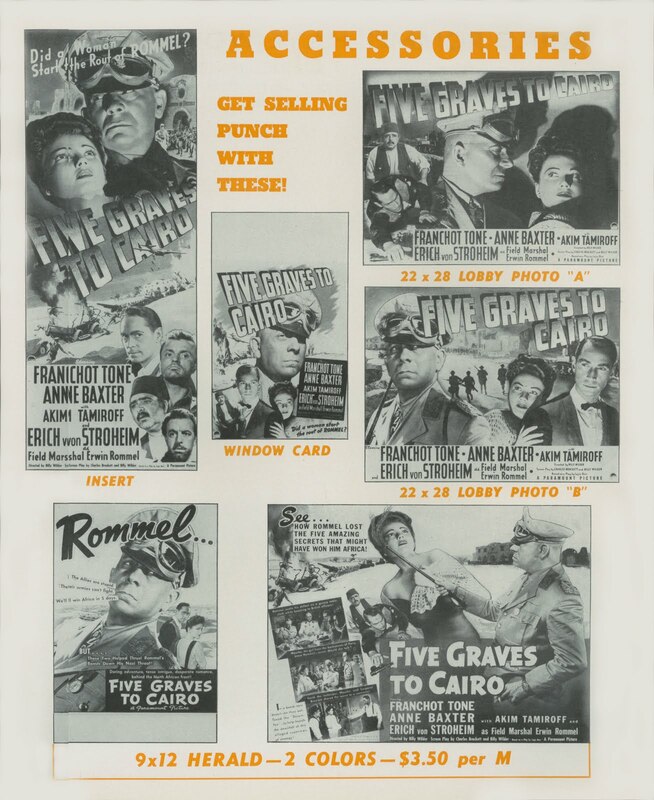 Rushed From Lab To You For Earliest Possible Bookings To Catch The Flood Tide Of World Attention, said trade ads published at the beginning of May just prior to Five Graves' opening. 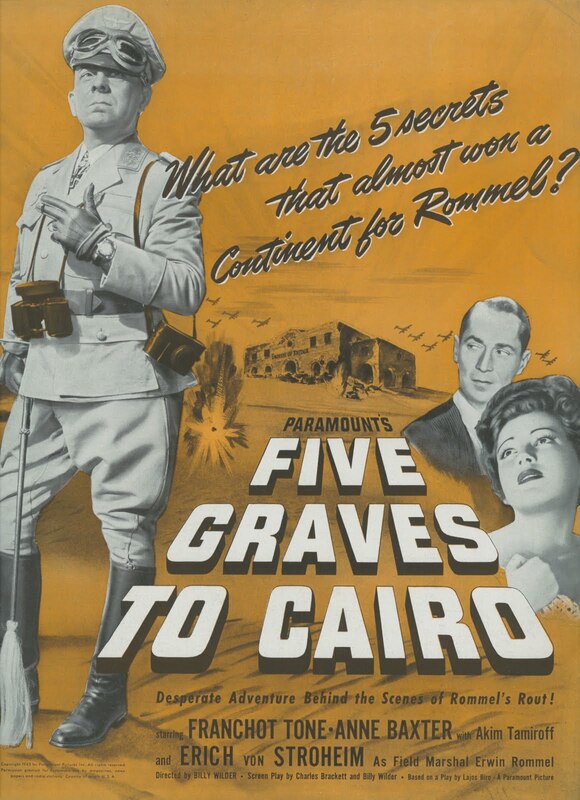 Judging from posters for Five Graves To Cairo, you'd think Von Stroheim was the whole show ... and he very nearly was. 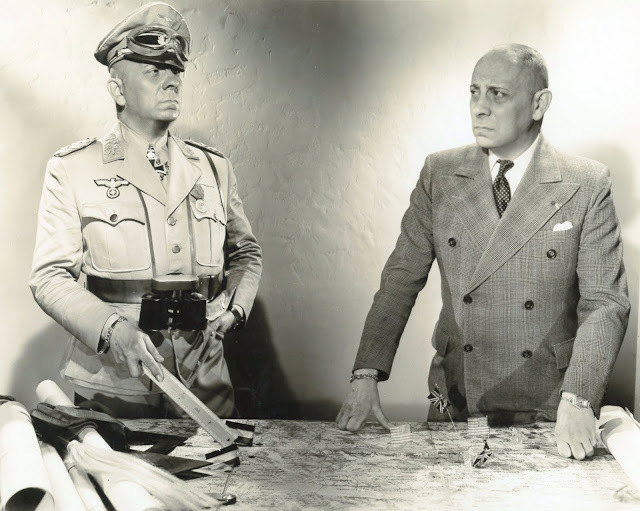 Paramount is negotiating with Erich von Stroheim to make a series of personal appearances with the film, said Variety in advance of the pre-release. Von had not enjoyed such notoriety in years, but did it go to his bullet head? 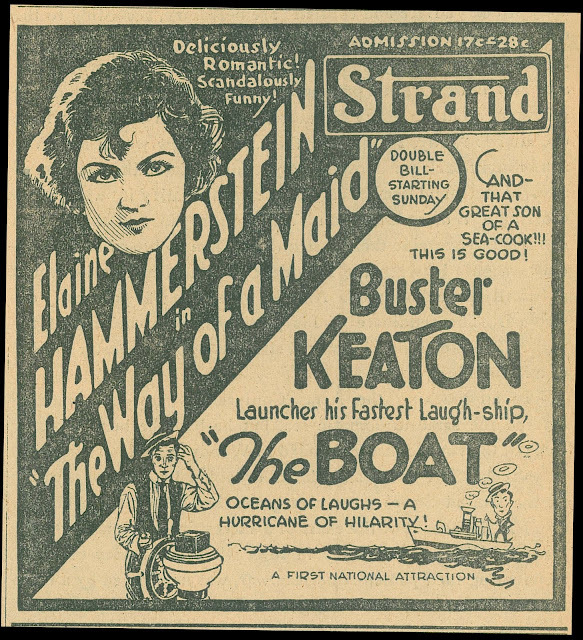 He'd initially agreed to help kick-off five or six key spots for the film, but saw the deal collapse in the wake of demands he made for what Variety termed too much coin, adding Von Stroheim some time ago agreed to make personals at nominal cost, but since then he has upped his figure, and Paramount finally killed the idea. 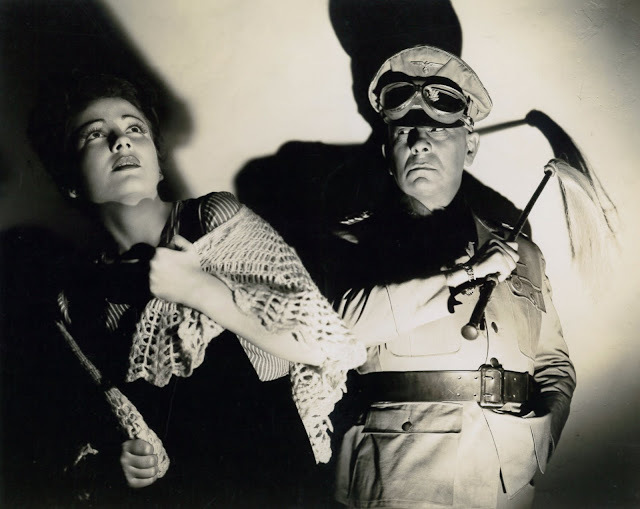 Trades did not report specifics of the actor's price tag, but it was known that Stroheim received $5000 weekly while working on Five Graves To Cairo. 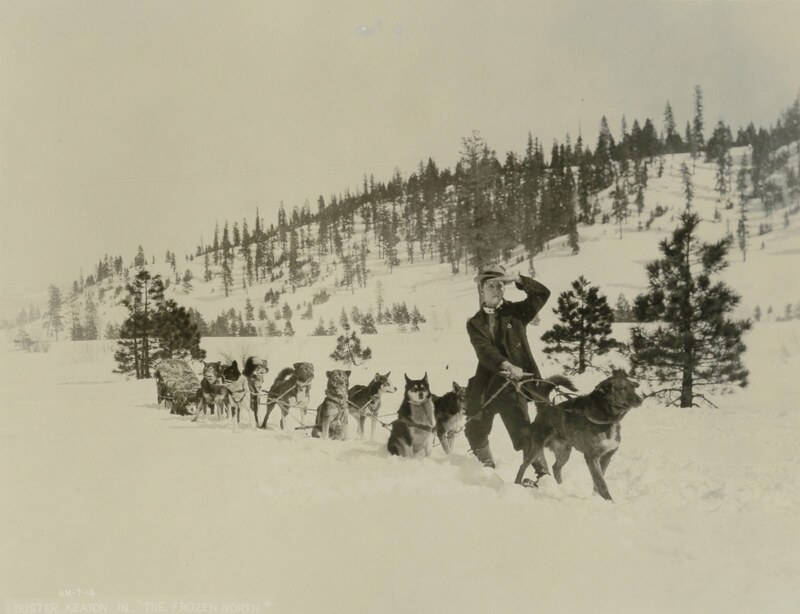 Whatever were circumstances, the Stroheim tour was canceled and publicity went on without his further participation. Von could take solace in knowing his face loomed largest in all advertising. Never again would he be so prominently featured in selling of a film in which he appeared. 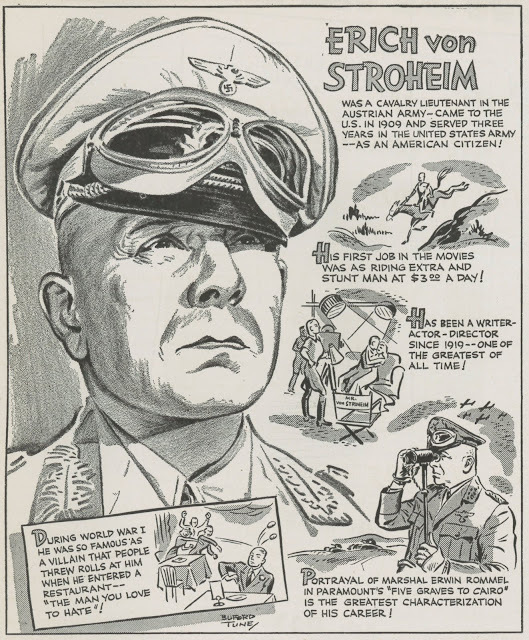 You'd have thought Stroheim's career would get a major uptick from Five Graves, but his Rommel was after all just a more sophisticated take on Horrid Huns he'd played since the previous war. 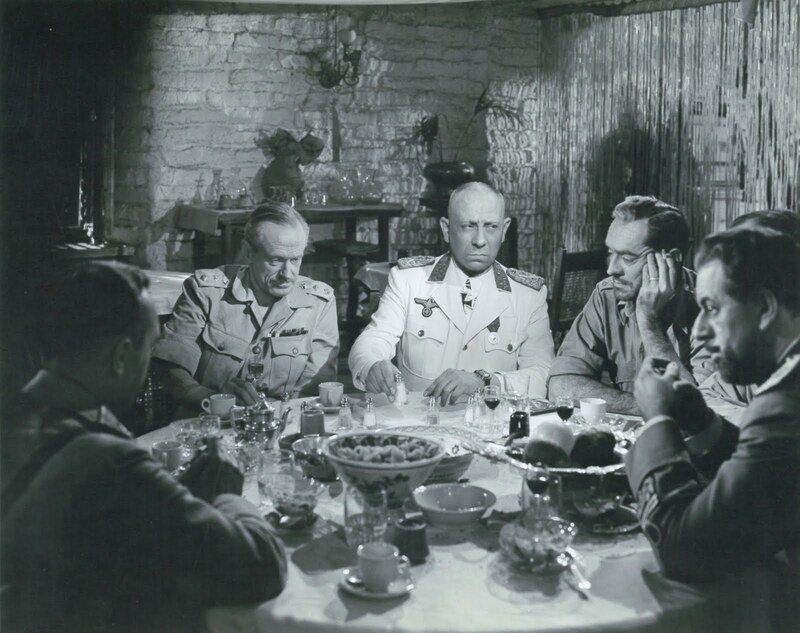 Wilder would remember though, and come calling again with Sunset Boulevard, a part not so imposing as Rommel, and for just that reason perhaps, not one Stroheim would recall with pleasure or satisfaction.